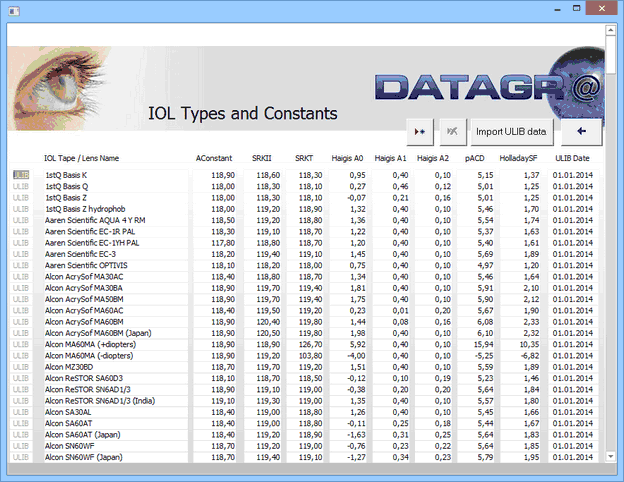 IOL constants can be imported from the ULIB (http://ocusoft.de/ulib/) database or entered manually. Imported ULIB constants can not be modified and show the date of the ULIB file. If a new version of ULIB constants is available, the complete ULIB database file has to be re-imported. Click the add new ( >*) button, to specify own lenses and IOL constants. Important Note: Datagraph comes with the latest available ULIB lens database. No guarantee can be given for its correctness and new IOL constants may be available after your version of Datagraph-med has been released. It is your own responsibility to double check and update IOL constants regularly.